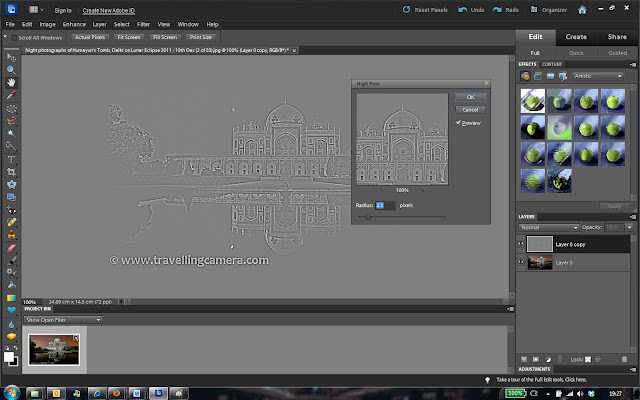 Let's go with step by step guidelines to do this in Adobe Photoshop Elements. 1. Open your photograph in Editor of Adobe Photoshop Elements. Go to File Menu and use Open option for finding the photograph in Windows Explorer... 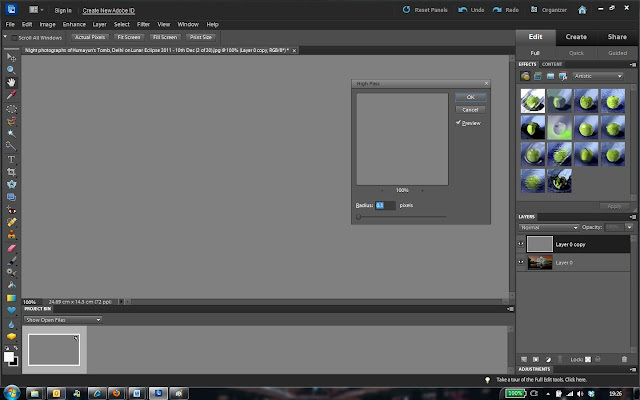 Image below is showing the workspace, which should be something on your screen. 2. Now duplicate your background Layer by pressing CTRL+J. 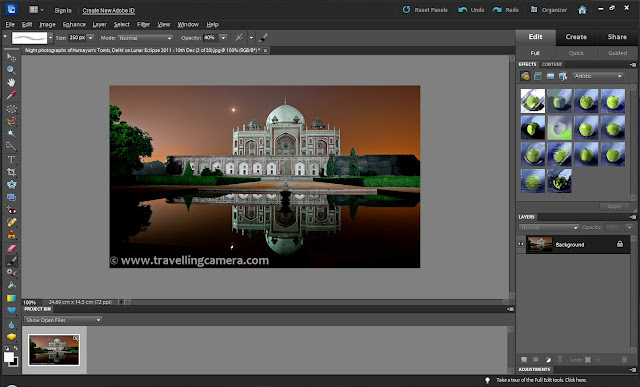 There is another of duplicating a layer through option under Layer Menu or Right clicking background layer on right side panel. Now you should be able to see two layers, as highlighted in image below. 3. Select top layer in your Layer-Panel and go to Filter Menu. Under Filter Menu, go inside Others Sub-menu and select 'High Pass'. 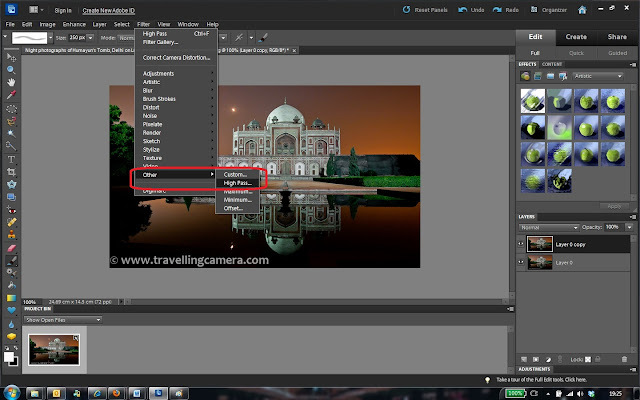 Please see image below to understand this step of Adobe Photoshop Elements. 4. This will launch a small dialog on your screen. Ideally it should look grey, if not just move the slider to extreme left. If Preview is checked Image in background will also look grey. Please see image below to understand how your workspace should look. 5. Now start moving this slider form left to right. Movement of this slider will give you some sense about sharpening. You will get more sharpening as you keep moving the slider on right side. When done click OK.
6. 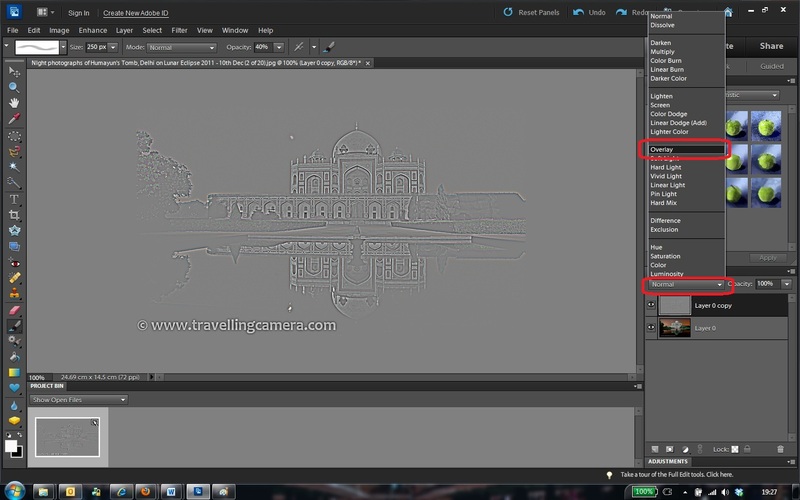 Now go to Blending Modes above Layer Panel and select 'Overlay'. Can you see the MAGIC? After following above steps, you see sharpened photograph in Editor workspace of your Adobe Photoshop Elements. Please feel free to comment back with more queries around the same.